Cowboy Lodge is a spacious studio, this cabin will take you back to the days of rustlers and bad guys in black hats. It has a very important kingsize bed, stacked stone electric fireplace, satellite TV with DVD. There’s a full kitchen, washer/dryer, and separate bathroom. Cook up some grub on the charcoal grill and then relax in the hot tub. Have your coffee outside on the soft, made for comfort chairs. Cuddle up on the comfy sofa and forget to go back to work. Yep, Pardner, we love this for you. Bring the pup, too. It’s pet friendly and we have “Dog Heaven” here. 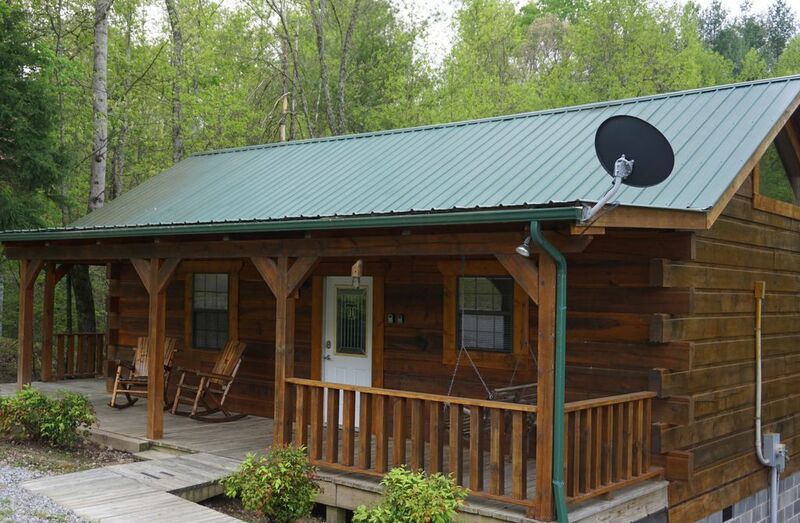 We have just recently added this cabin to VRBO but have been booking it for some time. This cabin is identical to our Bear and Deer cabins that have reviews on this site. We also have Viewpoint if there is a need for a larger cabin. I am a huge outdoor enthusiast. I love to hike, ride mt. bikes and motorcycles all through the national forest. I found Tellico Plains riding motorcycles in the area and fell in love with it. I want to share this outdoor playground. We had an awesome time at the cabin. Very nice place. Had everything thing you needed. Hot tub was great to help relax. We enjoyed the cabin and the area. Felt very homey. Some suggestions would be to add a shade to front door, put a cloths hook in bathroom, and fix fireplace. Amazing, felt like home away from home! We are from A very busy city in Florida and needed a nice little Thanksgiving getaway. The town is super quite, not much open with the holiday (we were not complaining!) the cabin was absolutely amazing, we felt right at home as we had our two little pups with us. The hot tub was great even in the freezing cold (again from FL). The bed and pillows were beyond great, we really didn’t want to leave. My now fiancé (proposed on our trip) and I didn’t want to leave! We will most definitely be back next to stay hopefully in the same cabin again and visit baby falls where we got engaged! Doug is super helpful and very quick to respond. Zero complaints here! Most definitely will be coming back! Thank you for the review! Congrats!! Thanks for the review. Cowboy cabin is private but not secluded. Highlands the area we are located in is 4 miles outside of Tellico Plains in a very nice private wooded area. We really enjoyed the Cowboy Cabin. It was spacious, clean, and in a wonderful, quiet, secure location. We were there for 6 nights. We saw dear, rabbits, fireflies, and coyotes. The big porch was our favorite place in the evening. The jacuzzi was relaxing after a day of hiking and seeing the sites. Our little dog was welcome and enjoyed the porch and large grassy area to run. Four star because the wifi was very limited (at first we struggled because the extender was not plug in all the way) and some of the pans in the kitchen were in horrible shape. Despite all, I would come back.